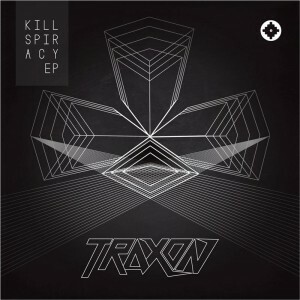 ESF Records is proud to present Killspiracy by Traxon, a night music project by Bruno from Minimal Criminal. Hailing from Brazil, he brings you his latest forest sounds to take you on a deep psychedelic journey into the unknown with dark twists to keep the mind in the groove—and in touch with all things killspiracy. Mastered at Rickshaw Studios with artwork by Vinni Xavier at 102 Studios. MP3 Download | FLAC Download | WAV Download · Download count: 8,457. Thanks for share this awesome work Bruno! aeee boquinha de giletee sonzera!!!!! WooW !! Just damn awesome .. such power behind this !! Intense and twisted, THANKS GUYS! all 4 tracks distort my entire perception of reality in a positive way. I enjoyed the subtle effects and atmospheres, but to my ears it lacks something special to distinguish it from other music like this. Focusing on the minute details of a song like “Nonsanto” is a rewarding experience. EEEEeeeeeita ! Somzera da porra meu irmão …. Sempre muita qualidade!! !